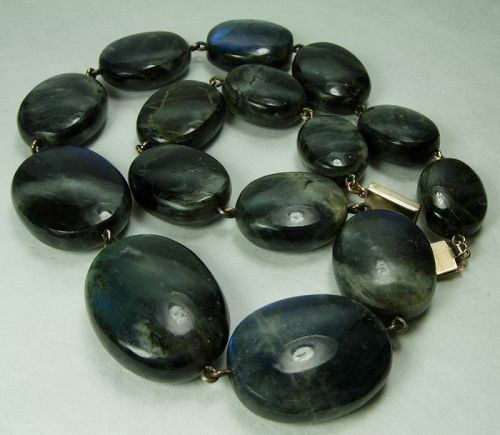 Fabulous hand made necklace, probably a studio piece, with fifteen very large graduated labradorite stones wired in 14KT gold and with a 14KT gold oblong slide clasp. The gold is not marked but tests positive for 14K with jeweler's acid. The stones have gorgeous gray, blue, and green flashes, and the color is ever changing. It weighs 109 grams. 17 1/4 inches wearable length and the largest bead is 1 1/8 inches long, 7/8 inch wide, and 1/8 inch deep. Excellent condition. Display form is life size. Photos enlarged to show detail.